How Theater Magic Really Happens! If you are a live theater or local history lover, or both, don't miss Backstage at the Hampton Playhouse, a program about a community theater that operated in Hampton for 52 seasons, closing in 1999. All are invited to attend the free program on Thursday, September 20, at 7 p.m., at the Tuck Museum of Hampton History. Ann Carnaby, who owns Tracy Theatre Originals in Hampton, is the presenter. 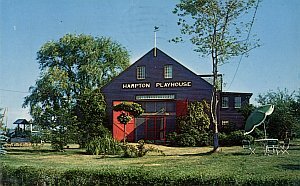 She moved to Hampton in 1980, discovered the Hampton Playhouse, and was involved in numerous aspects of its productions for 18 years. Her company designs and rents theatrical costumes and props for high school, college and community theatre productions. "Through Backstage at the Hampton Playhouse, I invite attendees to share my experiences in rehearsals and costume fittings, backstage and at home," said Carnaby. Carnaby and her staff at Tracy Theatre Originals created costumes for the plays including more than 35 musicals and eight burlesques, and trained interns in costume design and construction. Carnaby also hosted actors, actresses and the design team and held opening night parties for up to 75 members of the cast and crew in her Hampton home. Carnaby co-authored the book "Behind the Stage Door...an Inside Look at 50 Years of the Hampton Playhouse" with Bob Stockbridge, box office manager. The book takes readers through the playhouse's seasons with lists of the productions and photographs of the performances. It will be on sale for $10 per copy.